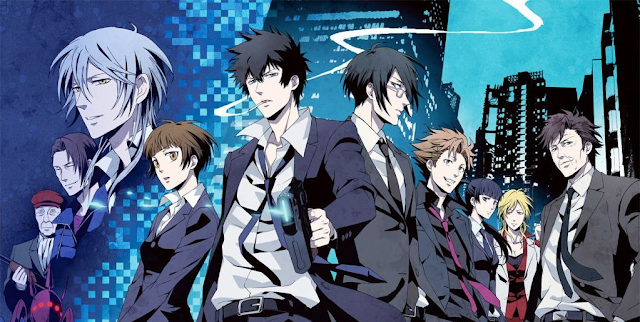 Spoiler alert: I did watch Psycho Pass, I did not like it, and it may arguable have been my type of genre but that doesn’t change the fact that I just didn’t like it enough to keep watching and finish. This was supposed to be one of those anime that everyone had glowing reviews about. Before we get started, here’s a quick update of what I’ve been up to. My cousin got married this weekend, so it’s been pretty busy, with dressing up and shoes and socializing- it’s all very exhausting really. Then the internet was also messed up throughout Saturday (shout out to PTCL and Nayatel for that. Apparently some underwater internet cable got wrecked, which resulted in a web free world for a day. And as of writing this post, my phone has decided to act up again. Psycho Pass is set in a futuristic world where everything is conducted through some sort of AI called the Sibyll System. This system runs the entire city (or world? I’m not sure), especially the security cameras and patrol robots. 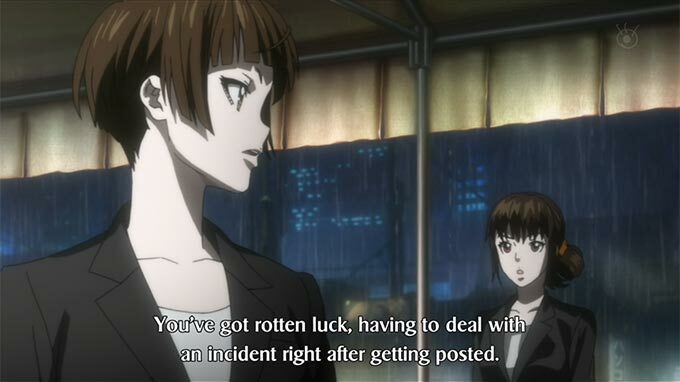 Sibyll’s job doesn’t end there though- it also scans people and judges their “Psycho Pass”- a sort of measurement of how someone’s mental state is and how likely they are to commit a crime. Based on Sibyll’s judgement of a person, it hands out careers best suited to them and can also have someone arrested before they even commit a crime. The series follows an investigator named Akane who is a law enforcer, working with the Sybill System to arrest criminals as well as potential criminals. The first few episodes, from a purely plot perspective, were not bad. The scene where a potential criminal, knowing he is condemned despite not doing anything, decides to commit a crime and his victim too is declared a criminal by the System, due to the trauma they had gone through, was certainly something interesting that was portrayed. I liked that part and in fact, I don’t even deny that the plot is good- it might be the greatest plot out there- but it just didn’t hold my attention. First of all, the art. It’s pretty, yes but Detective Akane’s nose lacks a bridge. Either she has failed to form her lacrimal bones or she has Wegener’s Disease and I’m leaning more towards the former. Wegener’s disease, or granulomatosis with polyangiitis has symptoms that first involve the respiratory tract, like runny nose, sinus infections, nose bleeds, coughing, shortness of breath, fever, etc etc which Akane couldn’t possibly have since she’s a police investigator, running around catching criminals. Anyway, whenever I see Akane’s nose, my own nose wrinkles and I find myself wishing I could reach into the screen and fix her nose for her. especially when all the other characters have well developed noses…. The second thing that really bothered me about Psycho Pass was some of the world building details. Akane’s house is shown, which seems to be fully operated by some sort of AI which has the power to change how the house looks, make food come out of a sort of dispenser as well as change Akane’s clothes while she’s standing in front of a mirror, like some sort of simulated video game house. How is any of that possible, let alone realistic. She can even stand outside, in public, and just switch her clothes. Like a video game character. You can’t just change solid matter into something else- even if some parts of science is somewhat magical, making clothes appear and change out of nowhere is not possible. The only thing I can think of is that the world in Psycho Pass seems to have discovered how to convert light to solid particles, and thus create a bunch of random stuff like clothes, furniture, food out of literally thin air. Either that, or it’s a world like Sword Art Online. It didn’t sit right with me at all and I ended up thinking way more about Akane’s nose and the unfair physics of that world instead of the plot and characters. I only got through about 3 episodes before I decided enough was enough and crossed Psycho Pass off my list. If something doesn’t hold my attention and I have to force myself to watch the next episode, then I really will waste no time knocking said series off my list. I have a limited amount of free time to work with and I really can’t find the strength in me to spend some of it watching something I don’t even like or enjoy seeing. I can’t rate something like this either, since I haven’t seen enough of it to form an opinion about the plot and the characterizations. But I don’t think I will ever willingly try to watch Psycho Pass again. It’s okay not to like something mainstream, even with silly reasons like the one’s I’ve listed out. After all, it’s entertainment. It doesn’t have to appeal to everyone. It’s okay to not like something everyone is loving! What are some popular tv shows or anime or books that you didn’t like at all? Have a nice day! They recommend you Psycho pass because of the ending. I dropped this anime 3 times for the first 3 episodes. But one day I decided to watch it no matter what and it was one of the best decision of my life. The almost crime free and utopian society is all in the front. It also shows what Elon Musk thinks our future could be.